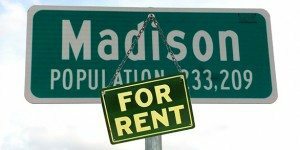 Madison has become a city of renters. That assessment comes as Madison’s Housing Strategy Committee drafts a market rent report examining the current trends and demands for housing. The city formed the committee in 2013, instructing it to create biannual reports on the market. The market rent report follows a 2014 biannual report focusing on homeless and low-income housing. That report found that half of renters in Madison pay more than 30% of their income in rent, the maximum percentage of rent that the U.S. Department of Housing and Urban Development defines as “affordable housing.” It prompted the mayor and the Common Council to create the Affordable Housing Fund, providing $4 million in annual funding for the next five years to create housing for low-income citizens. The new market rent report, Wachter says, seeks to understand Madison’s overall rental market. Using demographic data from the U.S. Census Bureau, vacancy rates from Madison Gas and Electric and average rents around the city, Wachter found that the city’s housing market is defined by extremely high demand for rentals. The demand is so great that even the current building boom isn’t keeping pace with the demand.